Another thread brought up the topic of space junk, which reminded me of something we do sometimes after watching the sun set. Just as the stars begin to show, on a clear night, is a 1-3 hour window of watching the ISS, Hubble telescope, and dozens of other large space objects fly-by when the sun relects off their skins. Its not too hard to see 3-5 objects per hour. What you are looking for is a light like a star that is moving without any flashing lights of an aircraft. For a little help, check out www.heavens-above.com. Click on the "change your observing location" link. Your Lat and Lon should appear in the box at the top right corner of the page. Once thats done, click on the "Daily predictions for brighter satellites" link. This produces a list of objects and times visible. The easiest to see are the when "Highest Point Altitude" comes close to your Latitude at the time listed. If you have iPhone, iPad, Android devices, install free version of Skyview app. I have been using it for 3 years now. Skyview app guide you to find stars, constellations, identify celestial objects like satellites, ISS, Hubble etc... in the sky day & night. Just point your device to the sky to stargazing around you. Stunning, in my opinion. No wifi or data connection required. High Wire thanks for the link. I remember the first satellite I saw was Echo 1 in 1960. It was a big silver balloon about 100 feet in diameter. One night I was at an air show in Lakeland Florida, a sailplane was doing aerobatics in the dark with fireworks on it's wing tips, a satellite was passing overhead and a rocket went up from Cape Canaveral to the east. It was a pretty magic moment. We signed up on the NASA site and get emails whenever the ISS is going to be visible to us. Very cool to go out and watch it pass over in the early evening. I prefer the ISS DETECTOR app (Android) for the space station and the really cool Iridium satellite flares. The cool thing is the countdown, compass needle and track, the point of flare or brightest reflection and it beeps when that point is reached. Really easy. With Heavens Above, you can see satellites on a regular basis....it blows most people's minds when they see the list of stuff flying around up there....looks like a traffic jam. Kudos to the Air Force if they are really tracking all them and the particles from all the impacts and separations. This is the Admiral and I camping at SunNFun, we did this for many years. Very small world! I was camping over with the Ultralights. Was that a 172? I think my first trip to Sun N Fun was in 1978. I know I was there in 1979 because I still have the tee shirt. There were only about 4 or 5 ultralights there. We all camped in a corner by the woods. 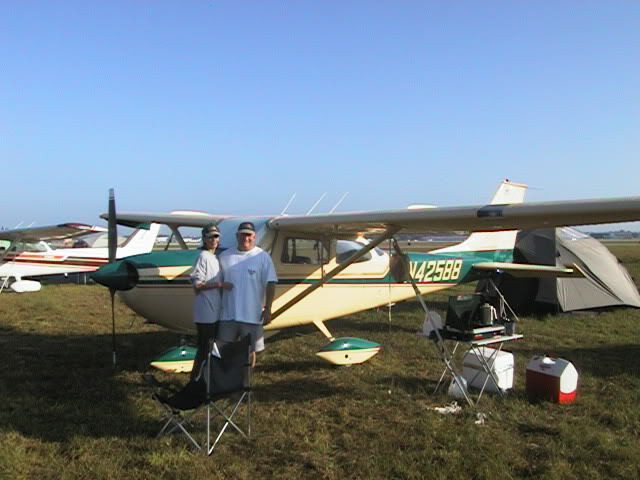 172 with big engine and CS prop I had a stol kit and 25gal aux tank added. I did not have it at the time, I was in Civil Air Patrol at the time working the show. We were camping on the South end with the worker bees. The pic was from 2004 or 2005 and I was there every year up to 2013, camping near the VOR. Good times. we used dry ice to keep the food (and beer/wine) cold for the 3 days as it was very rough camping, as you know.